Mumbai: A vaccine for breast cancer is on the horizon, thanks to a new partnership between Victoria University of Wellington’s Ferrier Research Institute and the Breast Cancer Foundation New Zealand (BCFNZ). 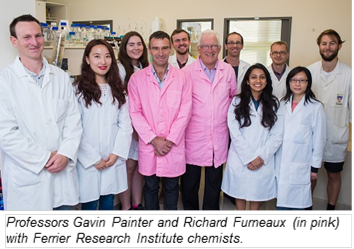 The five-year research partnership will see BCFNZ give the Ferrier Institute $500,000 to progress a significant breakthrough made by chemists at the Institute to create a life-saving breast cancer vaccine. Ferrier Research Institute chemists are making gains in the area of cancer immunotherapy—described by leading journal Science as the ‘Breakthrough of the Year’ in 2013. The Institute is developing a synthetic cancer vaccine technology that can activate tumour-specific T cells, producing a targeted immune response. This synthetic cancer vaccine causes rejection of cancer in several types of animal models. Professor Gavin Painter, who leads the chemistry team at Ferrier, says the support of BCFNZ is crucial. “Getting a new therapy to human clinical trials requires significant investment, and an intensive campaign of chemistry, biology and regulatory compliance. Cancer immunotherapy has caused a paradigm shift in cancer treatment, with a focus on targeting the body’s own immune system to fight cancer cells rather than introducing toxic agents to attack tumours directly. This line of research has led to the production of cancer vaccines which are showing promising results when used in certain situations; they are well tolerated by the body, have fewer side effects than current chemotherapy treatments and may be more effective in the long-term. The successful immunotherapy treatment platform pioneered at Ferrier in collaboration with the Malaghan Insitute of Medical Research, has led to the establishment of biotechnology company Avalia Immunotherapies, which aims to commercialise the vaccine technology to help patients. Avalia’s chief executive officer is Victoria alumna Dr Shivali Gulab, a former NZBIO Young Bioscientist of the Year who is based in New York driving the progress of the vaccine technology towards human clinical trials. For 20 years, the Ferrier Research Institute has had an extensive working relationship with the Albert Einstein College of Medicine in New York which has resulted in successful drug trials. These include some of the most powerful enzyme inhibitors ever reported including Forodesine as a targeted therapy for a variety of haematological cancers, and Ulodesine as an orally available drug to treat severe gout.